When it comes to reports and analyzing what seems like endless data, it can be information overload. What if there was an easy way to get a visual summary of all that information? Enter report charts and dashboards. The Lightning Experience offers enhanced data charts to summarize reported data. You can adjust the chart type without making changes to the report itself. Let’s see charts in action. Your CEO is so impressed with the work you’ve done, he’s asked for something special. He wants a way to display sales rep performance graphically. Click on Sales Rep Win Rates then to add a chart. Click the in the upper right corner of the chart to open the chart editor. Click to change the display to a vertical bar chart. Click to close the chart editor. Click then choose Save from the dropdown. The dashboard editor in Lightning Experience gives you a responsive way of creating or editing dashboards using drag-and-drop. Let’s take a look. Set the Name to Global Sales Dashboard. Click Select Folder, choose the Global Sales Dashboards, then click Select Folder. In the report search bar, enter Opportunities, click Opportunities by Rep, then click Select. From the Display As menu, click to select a vertical bar chart. Ensure the Y-Axis is set to Record Count. Ensure the Show Values box is selected. Ensure Sort Rows By is set to Value Descending. From the Display As menu, click to select to select a metric and ensure the Measure is set to Sum of Amount. Ensure Shortened Number is selected from the Display Units picklist. Leave the segment ranges set as is. Drag the metric component to the right of the Opps by Rep vertical bar chart. In the report search bar, enter Sales Rep, click Sales Rep Win Rates, then click Select. From the Display As menu, click to select a Lightning Table. Note: Opportunity Name and Amount should be the only remaining columns. Drag the Opportunities Won table to the right of the Total Open Opportunities metric, to create a third dashboard column. In the report search bar, enter Sales Rep, click Sales Rep Win Rates, and then click Select. From the Display As menu, click to select a gauge component. Leave the Segment Ranges as is. Change the Measure to Win Rate. Drag the Company Win Rate gauge to the right of the Opportunities Won component, to create a fourth dashboard column. You will need to resize the chart components to create four columns. Note: Don't worry, component arrangement on your dashboard is not checked when verifying this step. Congrats! You made it easier for your stakeholders to review their Salesforce data with ease and efficiency. 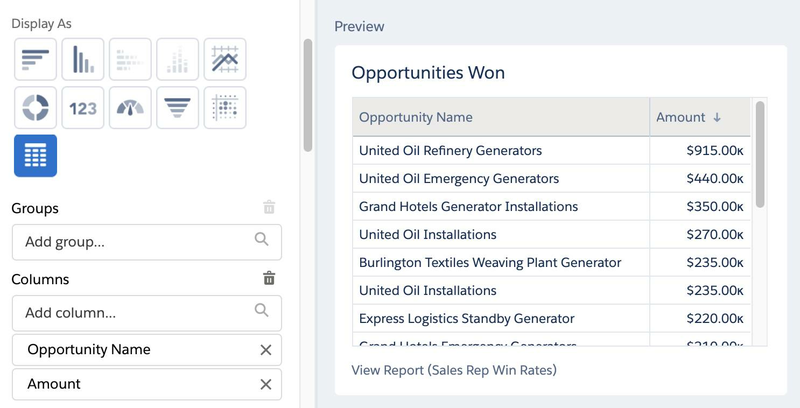 You harnessed the power of Report Builder to customize Salesforce objects and fields into meaningful information. Filters, report types, charts, and dashboards further segmented your data so only the most important information was presented. Great job—you just saved your executive team a lot of time and energy!